Languedoc-Roussillon is a beautiful and awe-inspiring place with plenty of sunshine and natural light, making it a magnet for artists. As such there are regular expositions where you can see the work of local artists. Allison Carmichael, a talented English artist whose landscapes in acrylics and oils, capture the beauty of Southern France. There are also several glass paintings in the gite, which allow light through, yet preserve privacy. Allison is co-proprietor of Gite des Cathares and uses her maiden name as a painter. 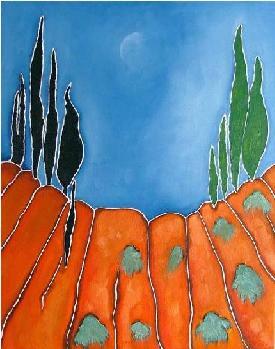 Click Allison's name for more examples of her work or click to see her landscape paintings. 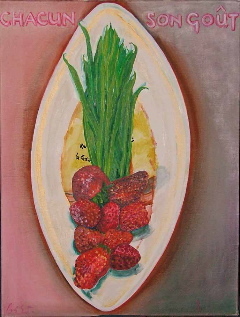 Vanilla Beer paints exciting, lively paintings of fruits and vegetables amongst other things. She is also an extremely gifted figurative painter and her work is rich in humour. Catherine Mascrès takes up the swinging movement from African or Hawaiian Dances, the symbolism of the Mayas and the Eskimos and the European tradition of painting and sculpting, always in the quest for Universal Harmony. 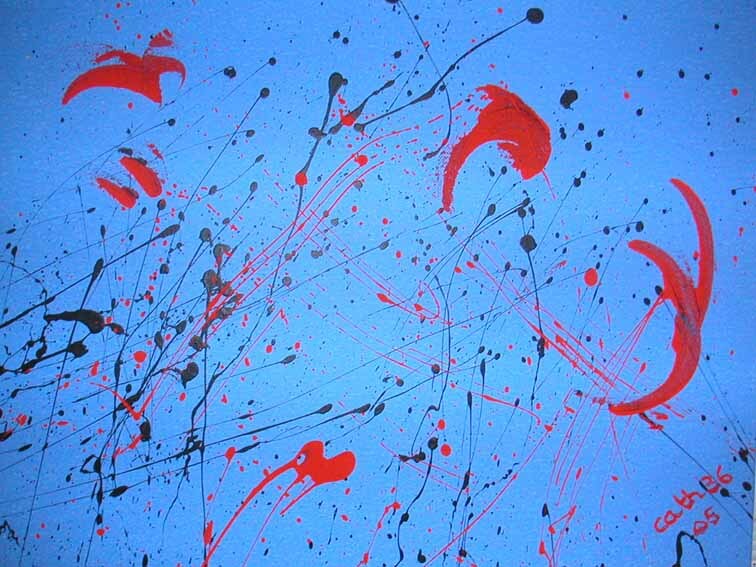 To see more paintings by other artists in the area, we highly recommend AudeCulture.com, which also has information about music, fetes, cinema, etc and Arts-Up.info which links to talented artists with a range of styles. 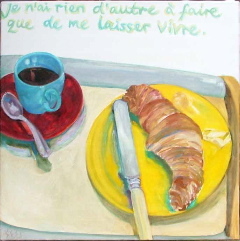 A portrait painting, Conte de Fees (Fairy Tale), by Allison Carmichael is shown below as is a photo of one of Vanilla Beer's paintings entitled 'Je n'ai rien d'autre a faire que de me laisser vivre'. Les artistes et les peintres avec une exposition de peintures au Gite des Cathares, Aude.